Orphaned when she was four years old, Ella traveled from Bangladesh to Brooklyn to live with her aunt and uncle, Anwar and Hashi, and her cousin Charu. The family has many secrets, and one summer when Ella returns home from college, a fateful chain of events is set in motion which will send the family on a trip to Bangladesh and along the way reveal hidden truths about them all. Anwar runs an apothecary and grows herbs and medicinal plants, including pot. He is also becoming obsessed with his neighbor, Ramona, and it threatens his marriage. Charu's good friend Maya moves into the house to escape her strict father who wants to prevent her from attending college, and Ella is immediately drawn to the young woman. Hashi, who owns a beauty salon and has a talent for seeing people for who they really are, gives Ella a makeover: a short, masculine haircut and a set of men's clothes. Probably my favorite part of the story was Ella's transformation as she discovers her own sexuality, and how easily accepted she was by her family. I think many non-Muslim Americans tend to think of Muslims as being pretty conservative, and that seems reflected in books and other media, so it was a refreshing surprise to find that this family is not mired in religious dogma. Maya, similarly, was not a strict Muslim. She wore a hijab (but not always), and ate ham and had a tattoo. This is, of course, no different from the way many people of various faiths pick and choose which parts of their religions they will adhere to, and it made the characters feel all the more genuine. The whole story felt somewhat loosely held together, but I don't know if it's because the author was trying to take on too much, or just because of how I was reading it (at the same time as Walden, so not super consistently.) The title refers to hallucinations that Ella has throughout her life, and I'm not convinced this is integral to the plot or to Ella's growth as a person. Through much of the story Anwar is penning a letter to Ella about a specific period in his past that he wants her to know about. When I finally saw that letter it was lengthy and went into too much political detail, so I lost a lot of momentum in a part of the story that should have had me eager to get to the end. Islam takes on a lot in her debut novel. Her story touches on marriage and adultery, gender and sexuality, religion and culture. I mostly enjoyed reading it, especially getting to know Ella and Anwar, who had a very special bond between them and I especially enjoyed the parts focused on them. Overall it was a satisfying story. 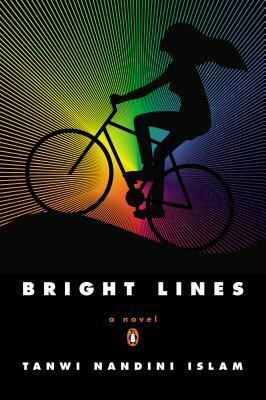 Bright Lines is available now. I received my copy courtesy of the Penguin Debut Author Program. I was not compensated for this review.